Sundek Air Cush Wooden Floor is safe and injury free sports floor with excellent and consistent resiliency, friction and ball bounce. It is designed to nullify injury impact on various parts of a human body. Sundek Sports systems engage in offering Air-Cush Volleyball Court. We offer Air-Cush Volleyball Court in various dimensions and sizes as demanded by the client.To develop Air-Cush Volleyball Court we use oak, teak, maple. The anti-skid polish coatings used for the safe playing and is certified from DIN. 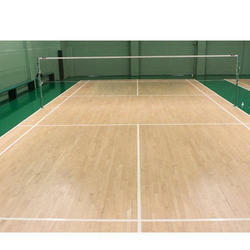 Sundek Sports systems engage in offering Air-Cush Badminton Court. We offer Air-Cush Badminton Court in various dimensions and sizes as demanded by the client.We make use of kiln dried FSC certified imported Beech wood, teak, oak, maple, wooden surface board and the base frame is made from imported spruce, fir, or pine wood. This Air-Cush Badminton Court is polished with anti skid polish. Sundek Sports systems engage in offering Air-Cush Multipurpose Hall for various sports under one roof. Air-Cush Multipurpose Hall is intended to fulfill the need for a sizeable hall for various functions and sporting activities. In this space constraint world, Multi Purpose Halls are ideal solutions to playing different sports on the same surface with prominent line markings. These Air-Cush Multipurpose Hall are also used to carry out exhibitions and fairs. Air-Cush Multipurpose Hall is designed to ensure no impact injury on the knees, feet, shins and ankles of players. The flooring is made from Maple / Oak wood selected for its exceptional strength, durability and high resistance to wear and tear. 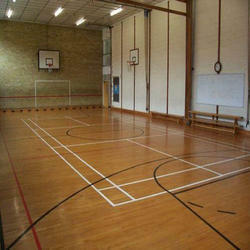 Air-Cush Multipurpose Hall flooring is resistant to the vigorous and extensive wear and tear due to use by the players. 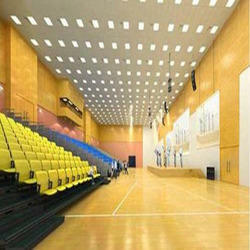 Air-Cush Multipurpose Hall is specially designed to give utmost pleasure to the players. Air-Cush Multipurpose flooring use in prestigious clubs, gymkhanas and other sport organizations. 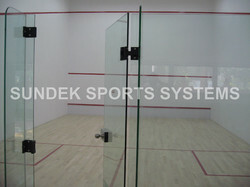 We are leading supplier of Air-Cush Squash Court. Exhaustively tested by leading competent authorities, the Sundek Glass Wall System meets all recommended safety standards and building codes. The design, manufacture and installation of all components are rigorously controlled and guarantees that repeated high energy impacts can be withstood without breakage whilst still providing an ideal court wall. The unique door hinge completely eliminates the risk of finger trap. The glass walls give spectators a clear unimpeded view of the action on court which also helps in coaching and a good view for the referee. The material used is wholly compatible with 12 mm toughened glass and able to cope with the constant stresses applied. 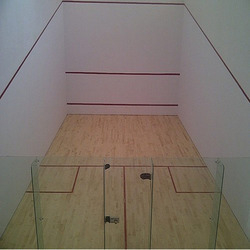 Squash Court Air Crush Wooden Flooring is engage offering a quality assured Squash Court Air Crush Wooden Flooring. These Squash Court Air Crush Wooden Flooring works are precisely accomplished using high grade wooden material and cutting edge technology. Further, we test these squash court flooring works against various parameters to ensure their strong construction and accurate dimensions as per the squash sport specifications. The Squash Court Wooden Flooring meets all the requirements and standards set by the international bodies/agencies/authorities/federations.